I'm back from New York and have lots of things to report -- the Fashion Tribes fashion blogger party, Diana Eng & Emily Albinski of Black Box Nation, Angel Chang's fashion technology show, finally meeting some of my fellow fashion bloggers such as Lesley of Fashion Tribes and Nichelle of 55 Secret Street, and more. I forgot my camera cable so I was unable to post up pictures while I was there but I was too busy to post -- having work and a friend's wedding to attend to make it all the more hectic. So bear with me, all good things to report will be up later today and throughout this week. 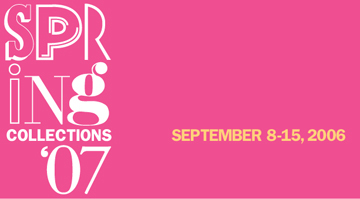 But more importantly, it's Fashion Week in New York and there are lots of things to check out. I will try to cover some of the interesting events happening. Today I hear is Marc Jacobs, although I read this yesterday on the plane in the Wall Street Journal and he's not in the official listings. I also heard from Diana Eng that Daniel Franco from Seasons 1 and 2 of Project Runway will be having a show today. Jay Mc Carroll and the Project Runway Season 3 Show will be on Friday. 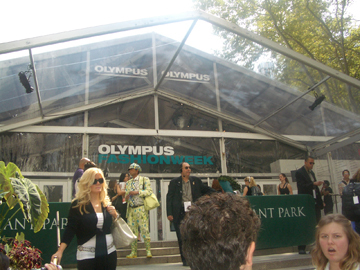 Check out the full schedule of events here at the Olympus Fashion Week web site.